Time for an easy, healthy weeknight recipe! I made this one night when I wanted something easy and light, that didn't require a lot of effort, but still felt like a proper (indeed, luxurious) dinner. So, I turned to that standby idea that Nigella loves so very much: rags of rare meat on salad. (See: tagliata, Ed's tender rump, Cambodian hot and sour beef salad, warm shredded lamb salad with mint and pomegranate). This time, it was simply a piece of lamb backstrap, which I marinated and briefly grilled, strewn atop a packet of salad leaves (yes, from the supermarket, judge me if you will). Now, what turned this dish from simple to special was the addition of little potato croutons. I remembered making something similar during my How to Eat project - once as part of a Caesar salad, and once as an accompaniment to roast lamb. In short: wash a potato and cut into one-centimetre chunks, then smoosh it around with some olive oil and a couple of unpeeled garlic cloves in a baking tray. Roast at 200C for approximately 30 minutes, until golden and crispy. Easy! Making the potato croutons does mean that the whole meal will take around 45 minutes from start to finish, but the whole process is very relaxed and low effort - no frantic juggling of pots, pans, a food processor and a kettle à la Jamie's 15 Minute Meals. (N.B. I actually love 15 Minute Meals - it's a great program/book, and in my experience the timeframes are definitely achievable if you are organised and energetic). No such exertion required for this recipe, though. You can just pop the potatoes on, marinate the lamb and then relax - check Instagram, send off a few emails, make yourself a drink - until it's time to grill the lamb, and even this only takes a few minutes. As for quantities - I've suggested amounts that make what I'd consider a nice light dinner, but only you know how much you feel like eating. Increase quantities, decrease, whatever you feel like! Just one note - one medium potato will make more croutons than I feel you need for that amount of salad. However, they are seriously addictive - like crunchy little chips! Trust me, you will start picking at them as soon as they're out of the oven. And you'll find that other people in your house, even those who have said that they didn't want anything to eat, will mysteriously drift towards the kitchen and start devouring them. Preheat the oven to 200C. Wash the potato (don't peel it) and cut into 1 cm cubes. 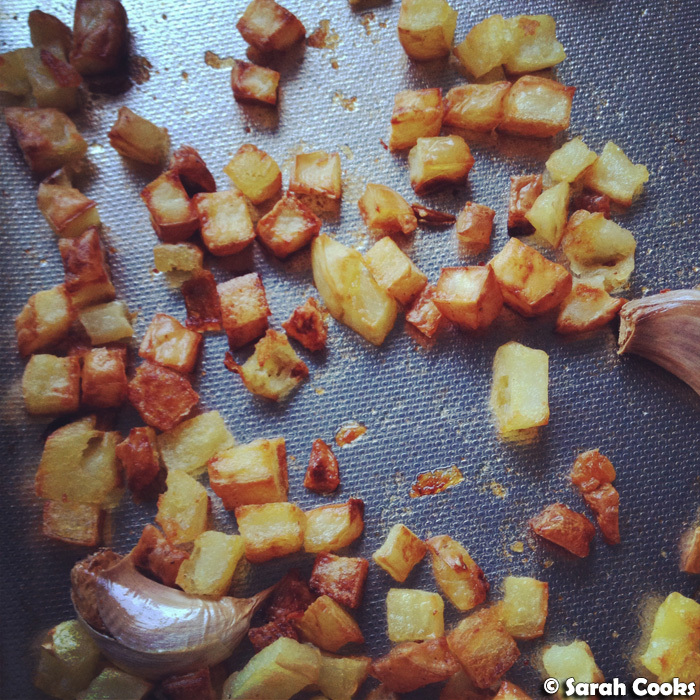 Place the potato cubes and 2 whole garlic cloves in a baking tray and drizzle with olive oil. Roast in the oven for approximately 30 minutes, or until cooked through and crispy. Meanwhile, drizzle some olive oil and lemon juice in a shallow bowl. Add the sliced garlic clove and any fresh herbs you are using. Season with salt and pepper. Marinate the backstrap in this mixture. When you're about 10 minutes away from the potatoes being ready, heat a griddle pan to very high. Grill the lamb for about 4-5 minutes a side, or until cooked to your liking. Allow to rest. Place the salad on a plate, drizzle with some olive oil and a squeeze of lemon juice. Slice the lamb into thin rags, and arrange on top of the salad leaves. 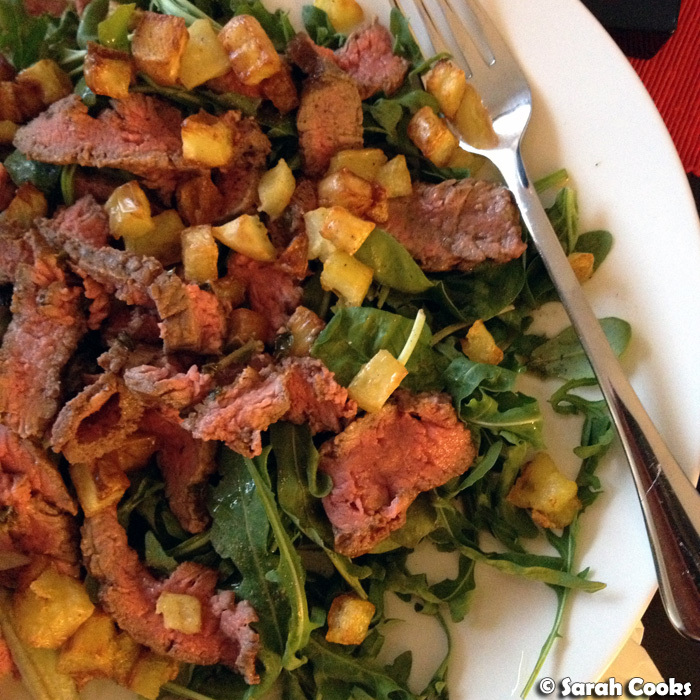 Toss the potato cubes with salt and toss over the lamb and salad. I love the potato croutons! And the lamb is incredible!